Sharing my home with Google and Alexa: Who’s the most helpful? Alexa or Google? For the past few months that's been the only question on people's lips when it comes to smart home supremacy. Other challengers are approaching: Microsoft has revealed its Cortana smart speaker strategy; Apple is expected to debut its Siri speaker as early as WWDC 2017; Samsung has Bixby on the way. For now though, the choice is Echo or Home - which is why I've been shacking up with both of them, using them side by side, quietly judging like a parent who absolute does have a favorite child but won't admit it. Both Google and Amazon boast how their smart speakers can enhance our lives, but I wanted to find out which one really serves me best. Who's got the IQ? Who can do the most? Who gets me? There's only one way to find out. Good luck to anyone, human or otherwise, who has to face me in the morning. I don't so much as "spring out" of bed as I do stumble haphazardly to the shower like a drunk zombie. But I've seen the adverts: beautiful people waking up in their beautiful homes, smile on their face, warmly greeted by their smart assistant to help them get ready for the day. Fact or fiction? "How's the weather looking today?" Alexa: "In San Francisco, it's 68 degrees with cloudy skies. Today you can look for lots of clouds with a high of 68 degrees and a low of 50 degrees." Google: "In San Francisco today it will be partly cloudy, with a forecast high of 61 and a low of 50. It's 61 and partly cloudy." The first request of the day results in a draw. Amazon and Google are using different weather services, hence the disparity in temperature, but they both tell me what I want to hear. Alexa: "Next on the calendar for tomorrow are two all-day events." Google: "Sorry, I couldn't find anything relevant in your calendar." So this is a flaw of Google's smart home speaker that honestly surprises me, and it's a shame Google still hasn't fixed it. Google Home can pull calendar information from your primary account, but not additional linked calendars. Alexa, on the other hand, can take info from all of them. You'd think Google would have the upper hand on its own services, but here we are. The problem here is that I use my work calendar for almost everything, and my primary one for very little. So Alexa was able to tell me what was happening tomorrow, while Google came up blank. "Remind me to pick up James at 4 o'clock"
Alexa: "I've added 'Pick up James' to your to do list." Google: "Sorry, create reminder is not yet supported." So Alexa doesn't set a time, nor does it remember the time I gave it, and just adds "pick up James" to my to-do list in the app. Meh. Google, however, just hits a wall. I'll give Alexa a quarter of a point here, but it didn't really do what I asked. "What's the traffic to work like?" Alexa: "The fastest route takes about 11 minutes via Polk Street and Jones Street." Google: "On your way to work, traffic is light as usual, it is 12 minutes by car." For some reason the Google Home app can't find my work address so I've had to use the closest it would recognize - which probably explains the extra minute. But otherwise, both are perfectly capable of saving me pulling out my smartphone. I can also use both to get an Uber if I need one. "How long will it take to walk to Golden Gate Park?" Alexa: "Your current location is 3.64 miles, 5.86 km from Golden Gate. As I don't know your speed, I can't tell you how long it will take." Google: "On foot, walking to Golden Gate Park will take you one hour and 45 minutes." I then followed up by asking, "What if I drive?" "By car, the trip to Golden Gate Park is 11 minutes with light traffic." With Google Maps at its fingertips, you'd hope Home would be faultless when it comes to maps - and it does. Sure enough it beats out Alexa here, with bonus points for contextual awareness. "Play the song that goes 'All that I want is to wake up fine'"
Alexa nails this one right away, correctly identifying Paramore, although she defaults to Amazon Music instead of my linked Spotify account. Google, despite being able to identify some lyrics, sadly doesn't get this one, despite multiple attempts. "Play the best album by The National"
Alexa kicked off with the "most popular", Trouble Will Find Me, while Google came up blank. Poor show on both parts - everyone knows The National's best album is Boxer. Google was better at getting I wanted when it came other bands, including The Beatles where it stuck on Alan Partridge favorite The Best of the Beatles. However it clearly struggled more than Alexa overall in this department, and often just came me lists of popular album names by the artist rather than playing anything. Both Echo and Home are equipped with a large arsenal of abilities. For Echo, these come in the form of Alexa Skills which you need to enable manually in the app; Google's advantage is that its own "skills" are auto-enabled out the box. But just how helpful are either at helping me get things done? "Give me movie show times for Guardians of the Galaxy 2"
Google: "Guardians of the Galaxy Volume 2 is playing at AMC Metreon near 16 and 14 other theatres." OK good, but when I asked Alexa she started listing show times at nearby cinemas too. Google didn't give me times, so... advantage Amazon. "What's the cheapest flight to LA tomorrow?" Google did this right away, asking me when I'd like to come home. The contextual language was also helpful here. After I'd asked about the first flight, I asked "OK Google, what about New York?" to which is was capable to answering. Alexa, however, cannot do this without a Skill. So I opened Kayak and from there was able to track down the cheapest flight. Google's advantage here isn't just that it's more seamless, but the fact it also asked if it should track the flight and deliver updates to my email if the price changes. "Who played Kylo Ren in The Force Awakens?" Google Home: "Kylo Ren was played by Adam Driver"
Follow-up question: "Who else starred in the movie?" "Its cast includes Daisy Ridley, John Boyega and 23 others." Alexa: "In Star Wars: The Force Awakens, Kylo Ren was played by Adam Driver." The key difference here is Google's contextual language processing, which let me ask a follow-up question (like I did with the mapping) without having to repeat the name of the movie. It's just a shame that each utterance must still lead with an "OK Google...". Still, it's another point to the big G.
"Add a work event to my calendar"
I've already used both smart home devices to check my schedule, but what about adding to it? Alexa managed this pretty well, adding an event to my Google calendar instantly once confirming the day and time - although she can only add it to your default calendar right now. Bafflingly, Google Home still can't add things to the Google calendar, as it told me explicitly when I attempted. WTF. So... nil points. "Turn on the living room lights"
I don't have a lot of connected home tech, but I do use Philips Hue. Both Alexa and Google Home have no problem with this one, and I can use both to change the brightness and colors of the bulbs. Many people keep their Echo or Home device in the kitchen, but are either worthy of being my sous-chef? "Give me a recipe for Katsu Curry"
Some of the marketing for Echo and Home has focused on their culinary skills, but just how much easier is it than whipping out a cook book or smartphone? Spoiler: not much. In Alexa's case, she can't just throw out a recipe on demand and will instead direct you to the Cooking & Recipes section of the app. Once you've done that, it comes down to the quality of that software, and even then I struggled to find something straightforward for my request. Google Home found this challenge a bit easier. "Would you like me to find you a recipe or would you like to find your own?" I was asked in reply. "To choose your own, use Google Search to find a recipe on your phone and tap the send to Google Home button below it"
Generally, you're better off searching in the app and sending it to Home. Google Home doesn't always pick out the best - or most accurate - recipe for your needs by voice alone. Once I'd found a recipe that I could send to Home, I did so, and Google was able to read out the ingredients, either in groups of three or one by one, before proceeding to the cooking stages. Advantage Google. However, I feel like in most cases people are just going to revert to other technology (or a book) until this experience is better. "Set a timer for one minute"
Both managed this pretty straightforward task equally well. Draw. "Where's good to get food around here?" Alexa: "Here are a few nearby top rated ones..."
Google: "I found a few places within 0.2 miles..."
Both answers gave me something, listing off a handful of options, but Google wins by being more specific on locations. Alexa sent its options to the app where I could read more information, which is handy, but then isn't the point of using a voice assistant so that I minimize my need to whip out my phone? OK, this one isn't really a fair test because it all comes down to my sense of humor, but I'm giving it to Alexa because she made me laugh more times than Google did. That said, Google gets the prize for this corker: "A woman once said she recognized me from the vegetarian club, but I'd never met herbivore". Solid gold. "Set an alarm for 7 o'clock"
Alexa: "Is that 7 o'clock for the morning or evening?" Google: "Alarm set for 7pm." Advantage Alexa. Yes it requires an extra interaction on my end, but that meant it didn't make any assumptions and I reduced the chance of setting an alarm for the wrong time. It's a tricky one, because both have advantages and disadvantages. That might sound like a cop-out answer, but Alexa and Google have some surprising differences. 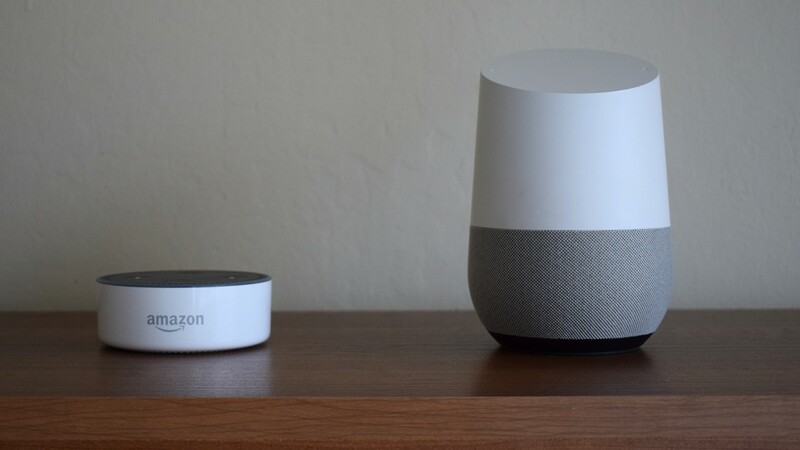 A major one is Alexa's need to enable Skills, while Google Home is able to use all of its abilities out of the box without them being switched on, and that makes it more seamless. As does the contextual conversation ability, even if this doesn't always work perfectly. As for Alexa, the need to enable Skills isn't just an extra task to manage, but means being aware of having to use different phrases for different functions. But Google also surprises me by lacking some obvious features, especially when it has the wealth of, well, Google hooked into its neural pathways, along with the range of Google services. Things are changing though. As we recently reported, Alexa has started learning new Skills without them being enabled. It seems this is going to be a gradual rollout (during testing for this feature, many of the Skills still needed to be enabled manually) so for now, Google has the more seamless experience. Google also has more "wow" moments when the contextual awareness works, making it feel like the smarter device. But overall it feels like Alexa is more useful for now due to the day to day calendar and alarms stuff and having more third-party Skills and functionality. The gap is getting smaller, and no doubt Google will be beefing up Home a lot in the coming few months. Come back at the end of the year and the answer may be very different indeed.